I’ve just written an article describing exactly how a washing machine controls water levels. This article is a follow up to it describing some of the faults that can occur with the pressure system. Various things can go wrong causing symptoms described below – but all these symptoms have other possible causes too so it’s important not to make assumptions. In order to try and understand pressure system faults you should read the first article to understand how the pressure system works. They are normally very reliable but it’s possible for a switch inside to stick either on or off (usually on). Connection faults on the switch can also prevent messages getting through to the controller resulting in similar faults. A switch sticking on will make the washer think there’s water inside the drum when there isn’t, and sticking off will tell the washer there isn’t any water in when there is. This would cause the washer to either not do the fast spin, or overfill. However, neither of these symptoms are exclusively related to a stuck pressure switch – there are more likely causes. If you blow up the pressure switch it should click on, and then off when the air escapes out. If it doesn’t click it’s faulty. However, it may have just 1 switch or more levels (up to 3 switches) so unless you know how many switches are inside you won’t know if it’s got one jammed or not. On average I would expect 2 levels, low level for wash and high level for rinse but it’s possible to have just one, or a third one for overfilling detection. The more wires, the more levels. If you know what you are doing you should be able to work out how many switches are inside with a continuity test meter or by looking at the wires. The pressure switches shown and described above have now been replaced with a different type. Instead of having mechanical switches inside that are operated by air pressure they have small coils with magnets inside that give a different resistance reading depending on how much air pressure is applied. The old style pressure switch has remained virtually unchanged for 40 years or more and has usually been one of the more reliable parts on a washing machine. It remains to be seen whether these (obviously cheaper) designs are reliable or not but in theory they ought to be very reliable still (if not more so) because of the reduced number of parts. Troubleshooting these modern pressure switches may be a bit more difficult without knowing the expected resistance readings. Damage to the pipe, or air leaks at the connection points on the pressure switch or plastic pressure chamber bottle can cause overfilling because air pressure is lost. Without an airtight connection it’s impossible to create enough pressure to activate the pressure switch or at last to keep it switched on. If the pressure chamber at the bottom of the tube gets blocked with gunge inside, then when the washing machine empties the water, the water inside the pressure chamber (which is only really a small plastic bottle) gets trapped because it can’t get past the gunge. This means that the air pressure is held inside the plastic tube so the pressure switch is jammed ON. A blocked pressure chamber bottle can also restrict or prevent water getting into the bottle in the first place causing the washer to take in too much water or to overfill. This would need a fairly solid blockage though and is much more rare than trapping the air pressure as described in the last paragraph. This is because the sheer volume of water inside the tub can sometimes force its way past gunge into the bottle, but because hardly any water actually goes into the bottle this very small amount cannot force its way back out when it drains (if there is a blockage). Finally, if a pneumatic door interlock is fitted that prevents the door opening when full of water, a part of the small pressure tubing (at the top of the pressure chamber bottle) branches off and fits onto the door interlock. The air pressure is therefore also used to operate a lock inside the door as described in this article different types of door interlocks. This type of interlock is rarely used these days because of cost cutting, but it used to be common on washing machines from the 90s. The relevance here is that gunge inside the pressure chamber bottle can also trap air in the tube that leads to the door lock preventing it from opening even when water has been pumped away. Not taking any water in or refusing to do a fast spin are other possible symptoms of faults on the pressure system related to the machine thinking there is water inside when there isn’t – but as with most of the other symptoms, other unrelated faults can cause the exact same symptoms. General help for these two faults can be found here – not taking in water and not spinning. When I blow in my washer pressure switch it clicks twice bur the pressure leaks out..in fact I can hear a hissing sound when I continue to blow after the clicks….I presume the diaphragm has a leak or perhaps it has an intentional leak. Should it have no leaks? Hello Mike, if it’s one of the old style pressure switches that physically turns switches on and off it should be totally airtight. You should be able to blow into in and place your finger over the spout and the click should hold. You might not be able to get a finger on it fast enough to trap both clicks but should be able to trap the last click which should hold until finger is released. But if you can tell that air is passing though it somehow it must have a leak. If this is the case I would expect the machine to overfill, or to constantly keep topping up with water as the air pressure keeps dropping (which would result eventually in overfilling) or it should abort the cycle with an error. When I start a cycle, my washer automatically starts in the drain mode and does not start filling with water. Would a problem with the pressure switch cause this issue? 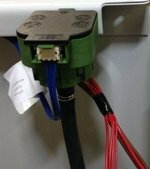 In relation to the pressure system, a fault on the pressure system (as described in this article above) could convince the washing machine it already has water inside and that would stop it taking any more water in. However, I would also expect that if this is the case the drum would start turning as if washing the laundry and it would also refuse to spin. A final possibility is if by any chance there was a fault or partial blockage in the pump or plumbing resulting in the washer not being able to empty the water out properly although I would expect it to be fairly obvious that there is still some water inside the machine. Hi Andy, I have a Samsung Top loader (FUZZY LOGIC). As soon as I press the power on button, The cold water solenoid energizes and water is let in. The water continues to run in until the power switch is switched off. I have replaced the solenoid with a new one but still does the same thing. Any Ideas?? I i disconnect the cold water, select a cycle and select only the hot water. the machine works fine?? Your assistance will be greatly appreciated. Hello Peter, it doesn’t sound related to the pressure system. The valve must be getting a live supply and a neutral return from somewhere. Insulation faults can cause weird things to happen. You would need an engineer with an insulation test meter to check it out. This sounds like a problem I’m having with my hoover washing machine, It fills for about five seconds then stops. goes through the program with hardly any water in the drum and then stops with an E03 drain problem message. The machine drains well though. I have replaced the water valves to no avail, and there is a good rush of water going in for the 5 seconds. The pressure switch appears to be working the pipe to it is clear, and there is no improvement when the pressure tube is removed. Any ideas? I’ seem to remember having this problem before now, and pressing a combination of buttons to reset the program? Hello Patrick. If you remove the pressure tube the washer should overfill. If it isn’t then I’d suspect the pressure switch though I can’t guarantee it. Ok thanks Andy, yes have removed tube and blown it clear, left it removed but still wouldn’t fill, disconnected the switch and no joy, does it fail open or closed do you know? It does sound like the pressure switch isn’t working properly. The pressure system tells the machine when it has enough water in and when the water has drained away. If it’s not doing either you have to suspect a faulty pressure switch or something’s gone wrong with processing or receiving its signals. This article explains how the washing machine controls water levels. thanks again, I will try a new pressure switch though a continuity test is saying its ok.
Pressure switches are normally very reliable. I’m presuming it’s an older type pressure switch with audible clicks when blown into. To test one you need to know how many clicks there should be. They can be double or even triple level so it’s possible for the first level switch to be jammed on making the washer think it’s got water in when it hasn’t. That would stop it taking more water in on wash and cause it to think the water is still in the machine on spin and refuse to spin. At the end of the day, attempting to fix faults that aren’t straight forward is a gamble and a risk of wasting a lot of time and money. Zanussi ZWG6122 failed to complete cycle – pump filter blocked. Easy enough to clear this, but then the machine wouldn’t do anything other than drain – all other programmes just turned on the pump, as though the machine was already full of water. Disconnected tubing from pressure switch and blew down it. Initially blocked but blew harder till bubbling noise from pressure bottle. Blockage cleared, pressure switch functions again and machine now fully operational. Many thanks for your article – saved me over £200. I have an indesit which on any cycle will start filling the drum for approx 5 seconds (if I open the fabric softener door I can see that water is traveling past and at a normal flow) then stops and hangs. I’ve taken the filter system completely apart, should I approach the pressure system next you reckon? Hello Billy. If it is a hot and cold fill washing machine there could be a problem with the hot water supply or the hot water valve in the machine. A washing machine will normally fill up with cold water for several seconds, pause, and then start taking hot water. If it is cold fill only with just one water valve then it is going to be difficult fault to deal with because clearly everything is working all right to allow it to start taking water in at all. A pressure system fault could cause issues with water levels but if the pressure system erroneously thinks the water has gone into the machine okay and stops the fill process it should then proceed to wash. So if the washing machine is hanging this implies that it is still waiting for the pressure system to be activated. Therefore suspect is more likely to be a problem in getting the water into the machine. Hi there. I’m trying to resolve a problem with my front loading LG machine (F1480QDS). The machine has been temperamental for a couple of weeks, regularly stopping towards the end of a cycle with the OE code. Even when the machine does – rarely – complete a cycle, there is often some water left, albeit it’s generally below the level of the drum. It does seem to drain some but not all of the water – I got a shock the first time I took the filter out when a significant amount of water came out. Interestingly this wouldn’t drain out of the drain hose. I’ve also noticed it’s not been washing properly, and doesn’t appear to be rinsing effectively. I originally thought it was a blocked filter and/or blocked drain hose but have managed to discount both of those now. I took the pump out of the machine yesterday to see if there were any other noticeable blockages/faults but none seen. I’ve ordered a replacement pump thinking it can only be the pump, but your article has now got me thinking about other potential causes. Any advice gratefully received. Further to my request above, I’m please to say I’ve resolved the fault – new pump fitted = problem fixed. Most satisfying, and only ~£20 for new pump from eBay. It could be that there is a blockage in your pressure bottle that is only temporarily cleared when you blow down it. The relevant advice is in my article under the section, “Pressure chamber bottle”. There is a link under that section that goes to a full article about clearing a blocked pressure system. It’s best to call an engineer if reading this article doesn’t help. Hi, I have a hoover OPH 714D washing machine, when i switch the machine on everything seems normal but when i choose a program the drain pump starts working and the door locks but no water is in the machine. I tried opening the door of the machine emptied a bucket of clean water maybe something else happenes but the water was emptied and the drain pump continued on working. I am to check the pressure switch by blowing and maybe trying to hear some clicking noises, i will then go to the pressure chamber which maybe there is any blockage. Any pointers please maybe you had a similar problem. Hello JPG. A fault on the pressure system could cause the machine to think it already has water in and stop it from taking in water. However, if it thinks it already has water in it should start turning the drum and “washing”. Such faults can also cause the heating element to energise which is a very bad thing with no water inside. However, if it starts a cycle by running the pump (which is normal) but then the pump doesn’t stop running it won’t be a fault with filling. This is because the pump should stop before it tries to take in water. If the pump doesn’t stop running it is stuck. A fault on the pressure system might be a cause but if so it shouldn’t work on the spin cycle either. Does it spin OK on a spin only cycle? Thanks Patrick. Which problem did you have that turned out to be the element? Hello Jean and thanks. It’s probably frustrating, but my article (and the previous – how the pressure system works) are intended to just give a good idea how the pressure system works. From there, if someone has the skills and experience at repairing things – but just not washing machines – it might help them diagnose a fault. Continuously pumping when set on a cycle could be caused by insulation faults on the machine. Continuous pumping could theoretically be caused by a stuck pressure switch if it has an overfill switch built in. I think stuck pressure switches are very unlikely these days though.